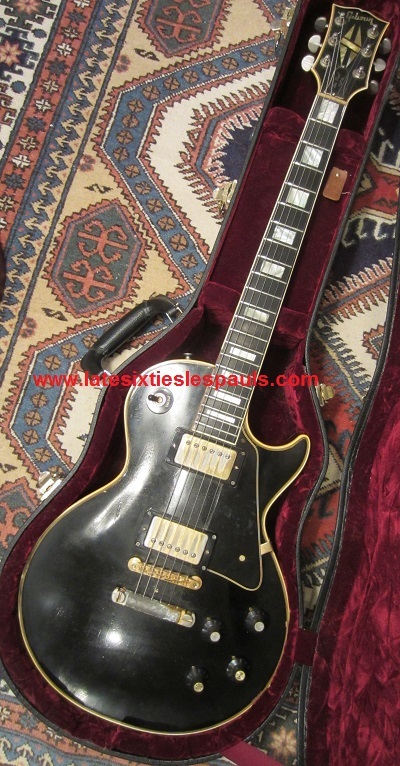 What is so special about Les Paul Custom 559XXX? It's mine. :) It has been through the ringer a few times including surviving many Louisiana summers in an attic. First, let's go over it's condition. Then, I'll tell the tale of supreme kindness that made the guitar mine and how that act inspired the very site you are reading now. My guitar shipped April 3rd, 1969. It's a 559xxx guitar with all '69 1pc construction and a long tenon. Typical for spring '69, it has 6852 pots. It has a center seamed top and weighs about 9.75 lbs with the Grovers. It would be about 9.25 without them. "Original" - Case (Orange Faultless with 50's latches), pickups, stopbar, studs, pickguard, all screws except for 1 truss rod cover and pickup ring screws (original ring screw literally turned to dust from rust), bridge original M-69 (neck is repop M-69), jack and wiring, knobs, poker ship, original pointers in case, original switch in case (corroded heavily), ABR in case, truss rod cover, and original finish except for back of neck overspray. "Louisiana Summers... in an attic!" - Survived many, many years in a Louisiana attic. If you aren't aware, Louisiana is about 90+ degrees F from March until November with 100% humidity. An attic would be 115+ degrees!!! A tough guitar, it's neck was arrow straight and didn't need an adjustment at all when I found it. "The Nut" - Was broken outside of the Low E string when I found it. The previous owner had wedged paper in there to try to hold the string in place. That didn't work, and it slipped out destroying the binding above the 12th fret and below the 2nd fret. Thanks previous owner! Why didn't you just get a new nut made???? "The Smell: The Faultless Case of Doom" - My original case lives in the garage. Why would I keep a case worth hundreds of dollars outside? Well, let's just say mouse pee and mold from living in an attic. :) I had to leave the guitar out of the case for about three years before it stopped being unbareable. She still smells a little ripe. "Pre-T, Patent Sticker Pickups" - Yup, somehow. Totally unmolested pickup solder joints showing pickups that should have never been on the guitar. I can only guess they were leftover from 65-67. They are the later style with orange wire and black/white leads. They SHOULD be identical, but with T-Top bobbins. 559xxx was found for sale by its original owner at a garage sale in 2003. It was found by a good friend's Uncle Johnny. 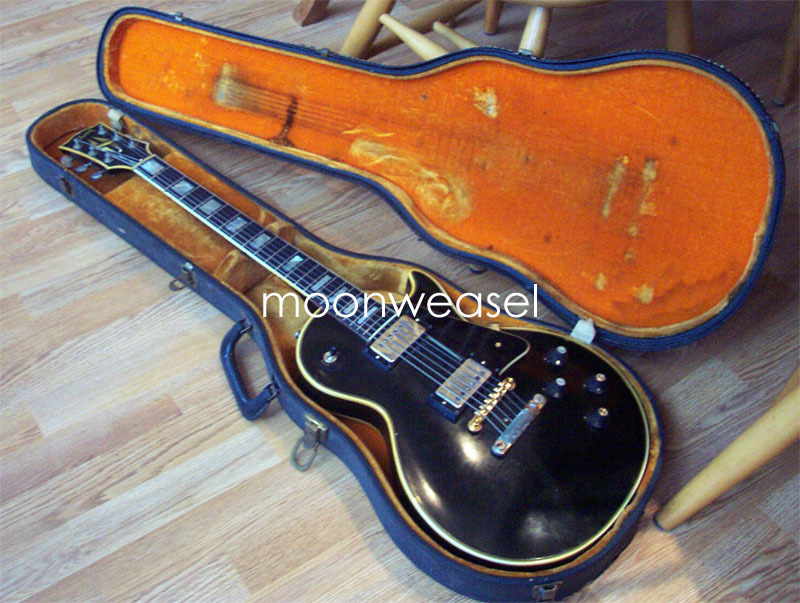 Johnny had found "an old Les Paul Custom in an orange lined case." I was asked should he go back and buy it. What would you do!?!?! I said YES, go immediately. I didn't know anywhere near as much as now, but I did now that LPC + orange case = 50's. Or so I thought. Johnny had found it early in the morning, but didn't get back to the sale to buy it until mid-day. That is garage sale suicide to go so late, but it was still there. The World's Smelliest Case, thanks mold. I went to see it as soon as I could. 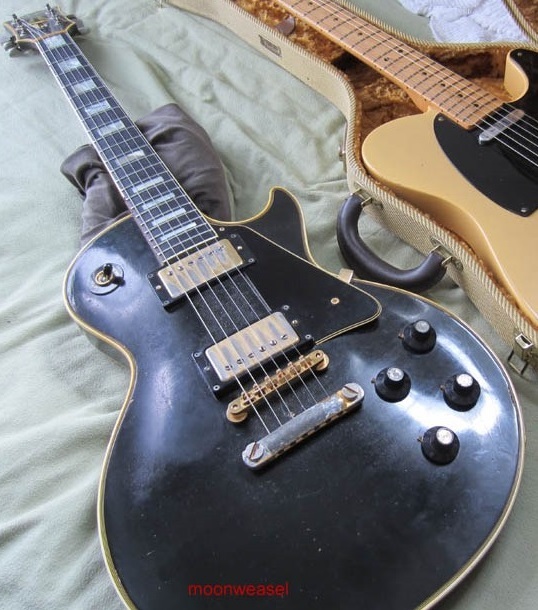 When I saw it had two pickups, I was really confused as Gibson made precious few (as in, a dozen or so) 50's LPC's with two humbuckers. I took to the internet, and there was literally NOTHING out there. Not a single site, no books, nothing. Everyone thought the serial numbers were misleading, and that was the only "fact" I could find. (Proved them wrong! The serials make complete sense.) Drew Vance, a Customer Service rep at Gibson, and I worked it out that it had to be a '69 LPC that shipped April 3rd. The guitar was rough. It was obvious it had not been taken out of the case in years, maybe decades. It had three strings and parts floating around loose in the case. I asked Johnny if I could borrow the guitar for a few days to put its original parts back on and write up an Ebay listing as a favor for him.